Much to the relief of thousands of Thalassemia patients, a team of researchers in India have found that the active ingredients in ‘Wheatgrass’ can actually help drain-out excess iron from the system of ‘Thalassaemia’ and ‘Leukaemia’ patients. This has been confirmed after a successful animal trial, now being put through human trial, and is likely to be turned into a drug soon for treatment purposes. The study, published in the science journal ‘Nature’, was actually conducted by researchers from Netaji Subhas Cancer Research Institute (NSCRI), the National Research Institute for Ayurvedic Drug Development (NRIADD) and NRS Medical College. According to NSCRI Director, Ashish Mukhopadhyay, a member of the research team, the ingredients promise to reduce frequency of transfusions. The transfusions are generally expensive, and are usually used to expand the lifespan of thalassemia patients, whose lifespan is a maximum of 20 years. Animal trials have proved that the ingredients are non-toxic. 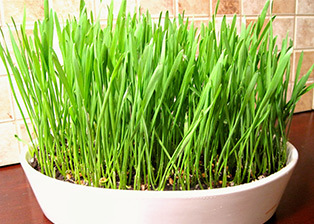 Wheatgrass is readily available and have no side-effects, researchers said. According to experts, this could be a major step in thalassemia treatment, and would be ‘godsend’ to several patients who survive on transfusion. Scientists from NRS Medical College, NSCRI and NRIADD got together in 2006 to analyse the properties of wheat grass. After a study of the juice, they identified a compound that absorbed iron. The team further examined the compound, and the results were all positive. The wheat plants to be used for the purpose need to be eight to ten days old. It is far cheaper and will benefit thalassemia patients who have had to discontinue treatment due to cost factors, said a researcher. This herbal remedy not only reduces the iron deposits in organs, but will also cut down on cost of treatment. The drug can be administered without pain and will allow patients to lead a more hassle-free life. The deposits left behind by the transfusion damages vital organs like liver, lungs, spleen and heart. A paper on this work has also been published in the European Journal of Medicinal Plants. Thalassemia is a group of inherited blood disorders that affect the body’s ability to produce haemoglobin and red blood cells. Patients with this condition have lower-than-normal number of red blood cells in their bodies and little haemoglobin. The bone marrow of Thalassemia patients, do not produce enough haemoglobin or red blood cells, leading to anaemia and fatigue, leaving the body organs short of oxygen. In severe cases, there may be organ damage resulting in fatality. In patients with severe forms of the disease, regular blood transfusions may be necessary. For people with very mild thalassemia, transfusions are not required, but, a healthy diet and plenty of exercise cannot be ruled out. Ayurvedic medicines are prescribed cautiously, as majority of the patients diagnosed with this illness are children, and the dosage of the drugs need to be adjusted carefully and should not be administered without consulting an Ayurvedic physican. Some of the drugs used for curing thalassemia are Abhrak-Bhasma, Suvarna-Sutshekhar-Ras, Suvarna-Bhasma, all of which are taken in combination of other herbal medicines such as Punarnavadi-Qadha, Daadimadi-Ghrut, Arogya-Vardhini, Panch-Tikta-Ghrut-Guggulu, Amalaki, Hartaki (Terminalia chebula), Marich, Pippali (Piper longum), Laxa (Purified wax), Kumari (Aloe vera) and Manuka (Vitis vinifera). To improve formation of blood in the body, herbal medicines such as Manjistha, Haridra, Daruharidra, Nimba, Bhrungraj, Tulsi are prescribed. Several diseases can be successfully treated by regularly drinking wheatgrass juice. Wheatgrass is used in treating arthritis, psoriasis, premature greying, general weakness, falling of hair, kidney stones, debility, weak eyesight, abdominal pain, constipation, asthma and insomnia. Several physicians have confirmed the miraculous effectiveness of wheatgrass therapy, and have referred to Wheatgrass chlorophyll as ‘New Age Food’, capable of alleviating several sicknesses in humans.